April VPS Promotion: Get up to 25% off new orders! 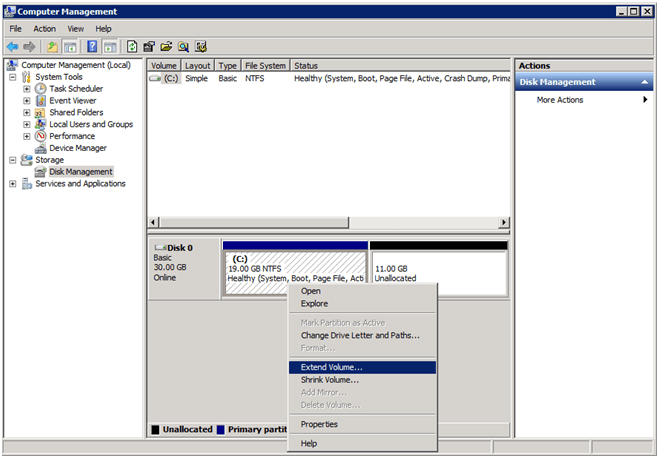 This procedure is only needed if your VPS disk did not auto-extend. You can follow the first two steps below to check. 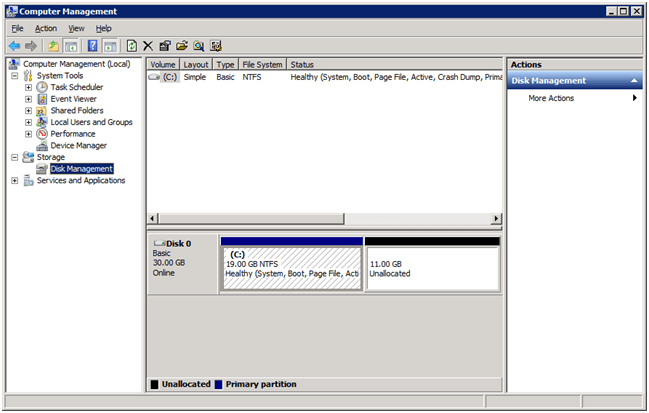 If you don’t have a large amount of "Unallocated" space then these procedures are unneeded. 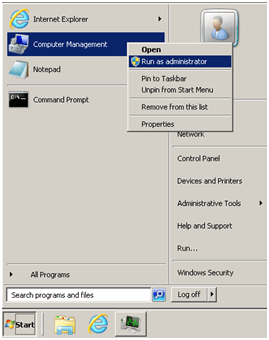 Go to [Start Menu] > [Computer Management]. Go to [Disk Management]. 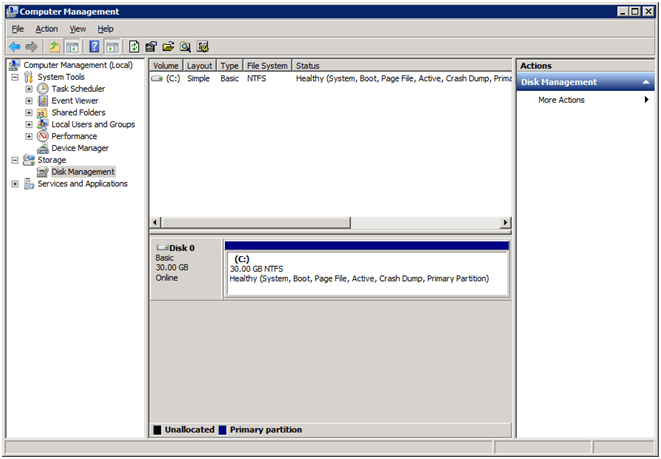 Notice you have [Unallocated space] for your disk. 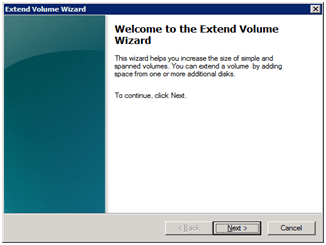 Right click on the [C:] drive and choose [Extend Volume]. Click [Next]. 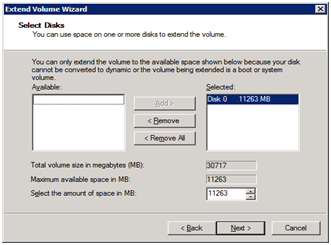 Note: The [Select the amount of Space in MB:] should match the [Maximum available space in MB:] to utilize all the unallocated disk space. Done. 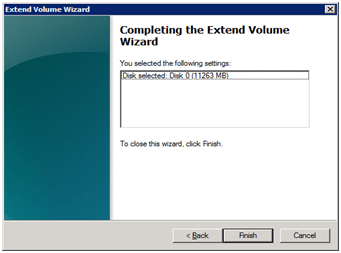 You have extended the disk to utilize all available disk space. Go back to Knowledge Base. Caution: Trading involves the possibility of financial loss. Only trade with money that you are prepared to lose, you must recognise that for factors outside your control you may lose all of the money in your trading account. Many forex brokers also hold you liable for losses that exceed your trading capital. So you may stand to lose more money than is in your account. ForexVPS.net does not guarantee the profitability of trades executed on its systems. We have no knowledge on the level of money you are trading with or the level of risk you are taking with each trade. You must make your own financial decisions, we take no responsibility for money made or lost as a result of using our servers or advice on forex related products on this website.